Ok... so... skin and bones made of some carbon-based molecule stronger than ship's armoring. Carbon nanotubes? buckyballs? Graphite-based uber-materials? Back spines as heat radiators, ok... even the biolumination they do could be release of heat as light. Blood (of whatever elemental nature) used as a coolant. Some sharks have blood systems set up inside their gills that allow oxygen transfer without the transfer of heat. Why not a similar system writ large to prevent hot/cold blood from interacting? Jaw extension during release of nuclear blast. Why not? Snakes and some lizards expand their lower jaw in order to swallow prey. Parallel evolution. New nuclear element powering at least the breath weapon, if not the whole animal. That is new and interesting. 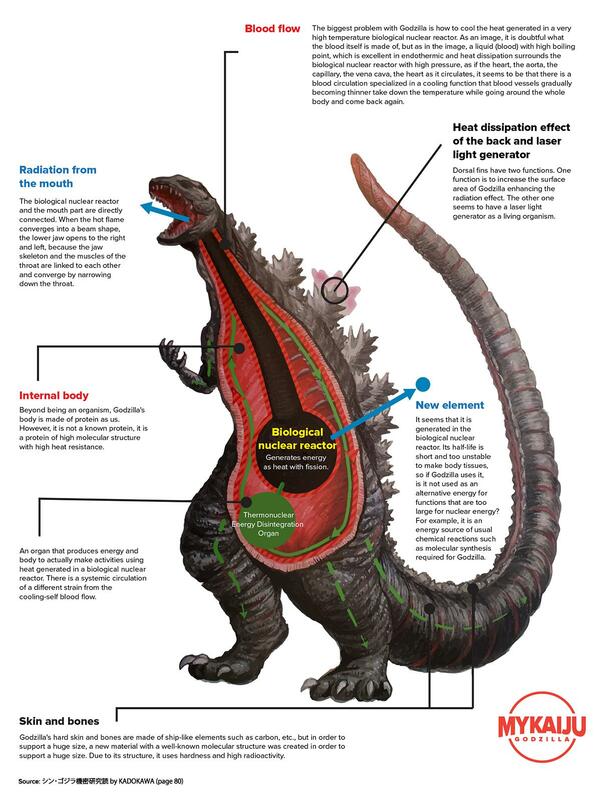 Has anyone ever figured out what Godzilla normally eats? (Fish-zilla doesn't count).